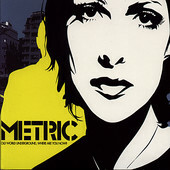 In Music We Trust - Metric: Old World Underground, Where Are You Now? New wave, indie-rock, and power-pop come crashing together in this explosive full-length debut. Metric's Old World Underground, Where Are You Now? is a hook-laden, glorious collage of pounding rhythms, beautiful female vocals, and lush soundscapes all melded together with a rock 'n' roll bite, kicked up a notch with the pure joy new wave seems to bring the band. Comprised of Emily Haines (vocals, keyboards) and James Shaw (guitars, vocals), the main duo behind the band, and fleshed out by Josh Winstead (bass) and joules Scott-Key (drums), this Canadian-based act delivers one of the year's most refreshing, exhilarating records. A punchy, fiery blend of gentle, soaking melodies and in-your-face, get-up-and-dance beats that make you want to have fun. The delicate "Calculation Theme" contracts the danceable "Wet Blanket", while a song like roaring "ICU" starts the album off with plenty of power, blending the band's rocking side with their soft, sweeter side, giving you an instant taste of what you'll find throughout this glorious ten-track disc. "On A Slow Night" sounds as if it's going to take you on a rocket ride, but simmers down, giving you a taste of the band's late-night pop side, before the new wave rocker "The List" kicks in and gets you dancing again. This is a solid offering from one of the best new wave-esque bands out there, a band that knows how to meld and blend, pay homage, and create, while offering up their own sound, even if it isn't new or innovative. It's still one of the cream of the crop offerings. I'll give it an A-.